Denver seems to be getting a bad rap for new ugly buildings. You can get a daily, maybe hourly dose, of design criticism from reading Brad K. Evan’s Denver FUGLY site. I thought there was no better person to address this topic than Ken Schroeppel. Schroeppel is uniquely qualified to address and assess the state of Denver’s architecture and aesthetics of buildings. Schroeppel is a faculty member of the College of Architecture and Planning at the University of Colorado Denver. He teaches in the Master of Urban and Regional Planning program. He also is the founder of the DenverInfill and Denver Urbanism website and blogs, must-reads for those who want to keep tabs on sustainable design, urbanism and updates in the Mile High City. CREJ: Ken, why do you think it seems to be open season on the design of new buildings in Denver? Schroeppel: I believe “quality of design” is normally distributed. Picture a bell curve with the x axis as design quality and the y axis as the quantity of buildings. At the left end of the curve are a few really awful buildings and at the right end of the curve are a few really exceptional buildings. And in the center—the tall part of the bell curve—are the majority of buildings that are generally average in their design quality. These are the “background buildings” that make up the bulk of the urban fabric of every city. 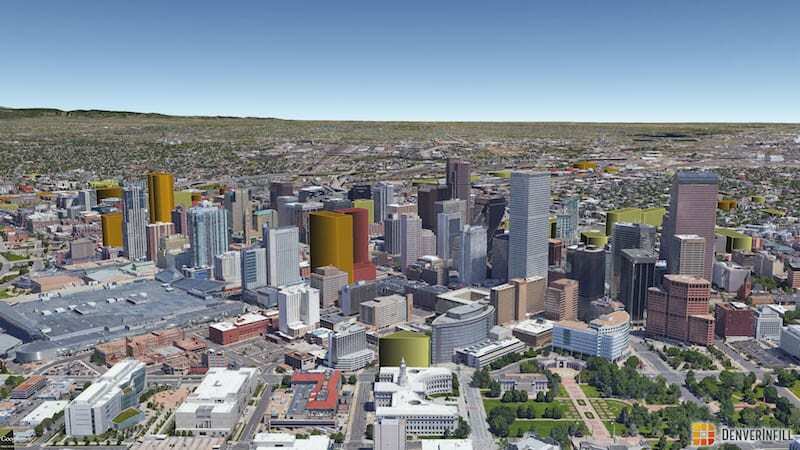 A peek at Denver’s future skyline, courtesy of 3-D images on DenverInfill.com. CREJ: So is this something we just need to learn to live with? Schroeppel: We can’t change the bell-curve nature of design quality, but what we should try to do is move the average—the center of the bell curve—to the right (increase the quality) over time through a combination of expanded design regulations and public awareness about architecture, planning and urban design. CREJ: Do all of the cranes dotting the skyline make people more cognizant of the changing urban landscape? Schroeppel: Due to the huge development boom in Denver right now, there are a lot of average buildings being built, so people take notice and voice their opinions about it. CREJ: And, of course, beauty is in the eye of the beholder. Schroeppel: Quality of design is somewhat subjective, so in any debate about the design worthiness of a building, you will usually find some people who think the building is ugly and others who think the building looks nice. Typically, the people in the “it’s ugly” camp have the loudest voices. Also, some of the complaints about design quality is just cloaked antidevelopment NIMBYism. (Not In My Back Yard.) Some people just don’t like change and they don’t want new development. It’s not surprising to see significant overlap between the antidevelopment NIMBY crowd and the people in the “it’s ugly” camp. CREJ: While beauty is subjective and some critics may be opposed to growth, do you think Jeff Sheppard’s criticisms are on target? Schroeppel: Jeff Sheppard is right, however, in that an unfortunate trend in architecture today is to design a building façade as a patchwork of superficial colors, shapes and materials that seem extrinsic to the structure itself—and then lazily rearrange those elements into a different random pattern on the next building. Also, I agree with many people who are critical of the design quality of the smaller projects—the single-family homes, duplexes, and rowhome developments—that are going into many of our historic neighborhoods. Must every new dwelling be an EIFS-clad modernist mishmash? I also support the city’s current effort to revise the zoning requirements for the garden court building form. A DenverInfill update of the Coloradan. CREJ: Ken, you mentioned to me earlier that much of the new development is for new apartments, and renters tend to be less concerned about the appearance of buildings than condominium owners. Renters tend to be more focused on the price, amenities and location. Can anything be done to “up the game” of apartment developers, design-wise, when there might not be an obvious economic return for them? Schroeppel: Some developers are going to do only the minimum necessary to gain approval from the city for their project’s design. By instituting design standards or other regulations aimed at improving the quality of design, we can mitigate the worst of those offending buildings. CREJ: But there is a price to instituting design standards, isn’t there? Schroeppel: That extra regulation also increases the cost of development. Since we are experiencing a housing shortage and a cost-of-housing crisis, we need to be thoughtful about how we add more regulation to the development process. CREJ: It sounds like you think extra regulations are worth it, if done right. Schroeppel: Generally, I support expanding the architectural design review process. I would like to see the mandatory design-review process we have in Lower Downtown be applied to all of downtown Denver, and the advisory-only design review process recently implemented in Arapahoe Square be applied citywide. CREJ: What else can be done? An update of Union Tower West on DenverInfill. Schroeppel: We should significantly scale back our development requirements for automobile parking, particularly in the urban core. That would significantly reduce the cost of development, thereby providing more housing units at more attainable prices and help offset any increased costs due to more stringent architectural design requirements. Plus, much of the “fugly” in new buildings is directly caused by accommodating the private automobile: the monolithic parking podiums and their meager “screens” that attempt to disguise car storage are negatively impacting the aesthetics of our city. CREJ: Ken, along the same lines, in your opinion, do you think apartment developers have any fiduciary or moral duty to spend extra money on design to appease people who will not be renting their projects? After all, their clients are renters, not the people who drive past their buildings. Schroeppel: Yes, ideally, every developer should seek not only their necessary return on investment but also to contribute a building that the community will be proud of. But accomplishing that in practice can be difficult, and there are developers out there who are really only interested in their bottom line. Fortunately, we have a number of local developers who really care about adding long-term value to the community through their developments.